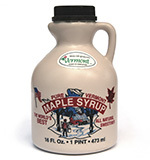 We have been producing our own Vermont Maple Syrup since our family purchased the farm back in 1942. We sell a variety of grades in jugs & will do special orders with decorative glass. We also offer other maple products, such as Maple Cream & Indian Sugar periodically. Contact us (802.775.2624) for details. Right now we sell our maple products from here at the farm. You are also always welcome to come up to the Farm any day of the week to purchase your maple syrup. We ask that you give us a call first (802.775.2624) to ensure someone is here (we may just be out in the barns or fields somewhere & not hear you arrive). You can also order by phone. Just call us and we will ship via UPS.